Anabol is a strong anabolic and androgenic product, and most often produces dramatic gains in size and strength. It has been called, "the breakfast of champions" by Arnold . It also increases endurance and glycogen retention. It is a derivative of testosterone, and is an extremely fast acting oral. It has terrific effects on the protein metabolism, and promotes protein synthesis, which supports the buildup of protein. This creates a positive nitrogen balance which is good for your overall health. An important reason why Anabol works so well is that the endogenous cortisone production is reduced by 50-70%. It is probably the best choice for a bulking cycle. This is not a steroid that you would want to use for cutting, but only to increase size and strength. A week gain of 2 to 4 pounds per week during the first 5 to 6 weeks is normal. The additional body weight comes from an increase in tissue (hypertrophy of muscle fibers) and water retention. 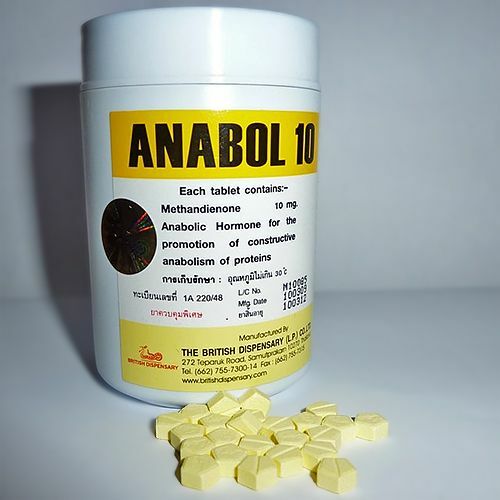 Women should not use Anabol because of it's androgenic component. With a combination of Nolvadex and Proviron, the aromatizing effects will be minimized. Use them to kickstart a few different long ester cycles. Last time I used it, gained 15lb in 4wks. Good gains while the test enant built up. My intake method: 30mg in the morning, 30mg before workout or in the evening (ed). Pump was great. Liked the price too. One of the best dianabol on the market, run Anabol 50 mg for 6 weeks and got 20 pounds. this guys have quality products. Great product!!! Took these first 5 weeks of a cycle. They were great. Big increase in strength and mass. Your neck and traps will swell up wonderfully. Only downfall is that you have to pop quite a few of them things if you want to run 40-50mg daily which is what i did. Overall a superb dbol if kept in range.